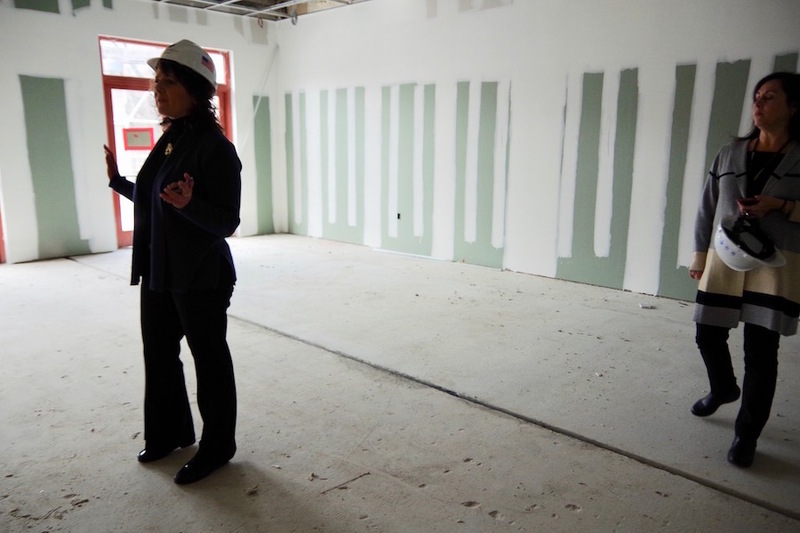 Judy Alperin, CEO of the Jewish Federation of Greater New Haven, led a tour of the permises earlier this week. The room to which she's gesturing will soon be a fitness center and TRX climbing wall. Lucy Gellman Photo. The fitness lounge is still empty, and covered in orange tarps. There’s fiberglass insulation hanging out of the soon-to-be climbing wall. And the cafe is caught in a dusty haze, instead of the thick smell of freshly roasted coffee. 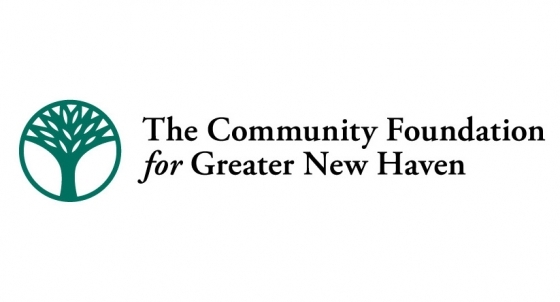 But the JCC of Greater New Haven is back, and working to take on a bigger role in the community as it reopens its doors. The space, located on Amity Road in Woodbridge, is abuzz with new life after a fire decimated parts of the building in December of last year. Earlier this week, Jewish Federation CEO Judy Alperin and staff members Debbie Brander and Nurit Kohl gave a tour of the space, before a Hanukkah party filled the building with light and laughter. It will hold a formal ribbon cutting on March 18 of next year. As activities resume piece by piece, Alperin said that a new focus on diversity and inclusion is at the forefront of her mind. "A lifestyle destination." Lucy Gellman Photo. It is a rebirth of sorts, with strategic planning initiatives to involve the wider regional community. When the fire ripped through the space last year, Alperin said, staff took the opportunity to think broadly about what a new and improved community hub would look like. The Jewish Federation held a series of forums, inviting voices from across the region to weigh in on where the new JCC should be, and what programming gaps it could fill. Ultimately, Alperin said, the organization decided to stay in the same place, and expand on offerings on its 106,000 square foot, 55-acre facility and backyard. While $1.7 million in insurance funds covered some of that upgrade, the JCC embarked on a $2 million capital campaign for the remainder. It is counting on membership, the price of which will not be raised, to keep the institution afloat. Alperin, with Brander (in the gray and black sweater) in a kindergarten classroom that is "almost ready" for kids to return. The classroom is directly over the men's sauna, where the fire originated last December. Lucy Gellman Photo. The center is working with local architects from Svigals + Partners for the project. Alperin said she is particularly proud of not only that design, but the installation of new fiberoptic cable across the building, which will allow for high-speed, wireless internet throughout the JCC. Now, in-house programs are coming back to the JCC in parts, with preschool and after-school groups already back on site. By the end of the month, Communications Director Nurit Kohl said that the organization will have finished its fitness center, which lays claim to a cycling room, TRX climbing wall, and silent meditation space. Architects have redesigned the gym to allow for not only basketball, but indoor field hockey, lacrosse, and other sports. The cafe. Svigals + Partners Photo. Then other pieces will fall into place: a “maker space” with a pottery wheel and place for high-tech equipment, co-working area, teen lounge, “Terrace Room” for rent, and revamped classrooms. In the hallway that overlooks the swimming poll and gymnasium, JCC staff will be working with a slate of local artists and the Jewish Historical Society to bring a suite of rotating exhibitions to a new Hoos Art Gallery. Alperin said she is especially excited about the new “heart of the building:” a cafe where the two wings of the building come together, and singles, teens, families and older adults can congregate and schmooze. Open Monday through Friday and Sunday, it will sell kosher sandwiches from Abel Caterers and locally-made salads and Middle Eastern dishes from chef Revital Catriel Bellin, who runs the salad company Revi’s. And good, freshly brewed coffee from local vendor Willoughby’s, “which we certainly didn’t have before,” Alperin said. In an effort to extend that programming, adult enrichment classes and cultural events will be held not just in Woodbridge, but Cheshire, Madison, Branford, and New Haven’s Westville neighborhood. Alperin said that the JCC learned to embrace that approach when a number of programs and people were displaced by the fire last year. While walking around the new building, she and Membership and Community Engagement Director Debbie Brander added that the building’s title may include “Jewish,” but the space and its varied programming are open to all community members. “We want to be that service provider for everybody,” she said.